Strobes. Over the last years I used Sea&Sea YS-60S, YS-90, and Inon Z-240 strobes. The Sea&Sea strobes are real workhorses, very reliable, and there is nothing to complain. I used them together with an Olympus C-7070 digital camera and a TTL converter (HeinrichsWeikamp). 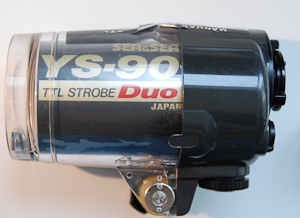 Used older Sea&Sea strobes are very affordable and easy to find at ebay. The iTTL of the newer Nikon DSLRs, such as the D80 and D7000, requires strobes that are able to produce a series of pre-flashes with very short time delays. 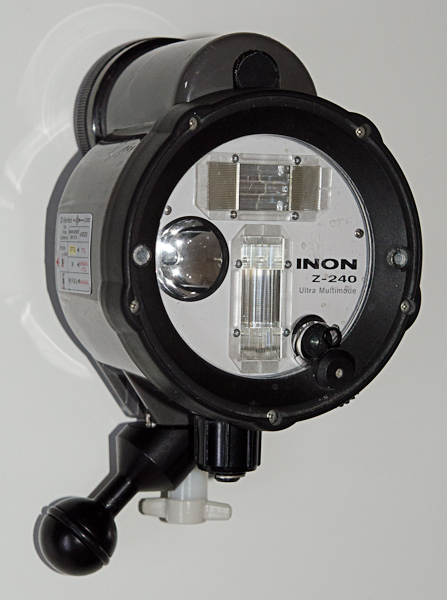 The Inon Z-240 is one of the fastest underwater flashes on the market, and used by many underwater photographers. This strobe is compact, powerful enough for most situations, reliable, and works with almost all digital and non-digital cameras. The only drawbacks are the high price - but at least one gets some value for money - and the basically unreadable manual. TTL. The invention of TTL ("through-the-lens") metering was a major break trough in the history of film cameras. With modern digital cameras, TTL works differently and requires a series of fast pre-flashes. Every brand of camera uses a different flash protocol, that in addition might change from one camera model to the next. The flash protocol currently used by Nikon is called iTTL. These protocols are proprietary, since the companies want you to buy their complete camera system including their flash system. The problem is that camera companies don't produce underwater strobes, and dedicated underwater strobes don't understand the camera's flash protocol. Most underwater strobes "understand" the Nikonos protocol which was developed in the old days of film photography. 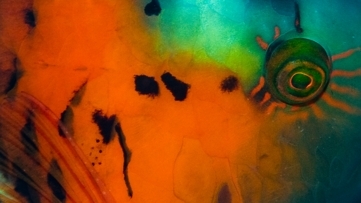 To use this protocol, the camera has to be connected to the strobe via an electrical wire. A flash converter is used to translate the camera flash protocol into the Nikonos protocol the strobe can understand. To get iTTL, the flash converter made by HeinrichsWeikamp can be connected to the bulkhead inside the underwater housing. For dual strobes, a Y-cable can be connecte to the Nikonos bulkhead of the underwater housing. This set up works pretty well with both the D80 and the D7000, although I sometimes had problems with the light output of the two strobes (Z-240) that differed considerably, even when using two identical strobes. Much more convenient is to control the underwater strobe by the internal flash of the camera, coupled via optical fibers. In this case the external strobe mimics exactly the flash sequence and duration of the camera flash, including the pre-flashes. The light of the internal flash has to be blocked, so that nothing is spilled outside, and is only used to control the external strobes. Modern strobes such as the Z-240 are able to copy the internal flashes of basically all camera brands, and are thus universally usable. The downside is that the internal flash has to be able to pop up inside the underwater housing. Since the internal flash is working when taking pictures, the drain of the camera battery is larger than without the internal flash. Due to the large capacities of the batteries of new camera models and some ingenious tricks to reduce the output of the camera flash to the minimum, this point is not of practical importance any more. With the Aquatica AD7000 housing both electrical wiring via the Nikonos bulkhead and optical triggering of the flashes via fiber-optic light guides is possible. Since the optical triggering is more reliable, I now use this technique exclusively. iTTL works flawless in the macro range and not as bad as I feared in the wide angle range. The nice thing with the Z-240 is that it can operate in many different modes which can be switched underwater. This means, one or both strobes can be switched easily from iTTL to manual mode underwater. The output of the strobe can be tuned when running in TTL mode both from the camera or directly at the strobe. And the manual mode has 11 setting, which should be more than enough for all situations. Batteries. Inon recommends Sanyo Eneloop rechargeable batteries (NiMH) that are very reliable and show a low self-discharge rate. I normally carry three complete sets of Eneloops. Important is to use an electronically controlled charger, such as Ansmann or Technoline battery chargers (e. g. Technoline BC 700). After several years of use, the Eneloops still produce about the same number of flashes per charge as at the beginning. However, the cell of one of the old Eneloops ruptured inside the Z-240 after a dive, the corrosive liquid was spilled, and the main O-ring pushed outside. Fortunately, the battery compartment of the Z-240 is completely sealed, and after washing with fresh water and careful cleaning the flash worked again without problems. As a precaution I now replace the Eneloops after 2 - 3 years of use. Arm System are used to keep the strobes in position. It can be very frustrating if the arms don't keep the strobe in position or restrict the positioning of the strobes. You probably will by an arm system only more than once if you don't by the right one in the first place. It will survive several generations of cameras and housings, and saving here doesn't pay off (just as with a tripod). I use U.L.C.S. flash arms which can be combined and adapted to any situation. The arms are very rigid, and assembled via a ball/clamp system. The friction can be easily controlled to keep the arms in position, or change it when necessary. They are made of lightweight aluminum, and basically indestructible. To increase the buoyancy, StiX Floats can be combined with the U.L.C.S. arms.